United Cakedom: Making Smoothies with Boost at the Oracle! Everyone has had a smoothie at some point in their life. If you are reading this thinking "I have never had a smoothie in my life!" then one you're weird and two you should remedy that like right away by visiting your local Boost! Mine is in Reading at the Oracle and I am ashamed to admit I have been walking past it these last few months looking, but never stopping. 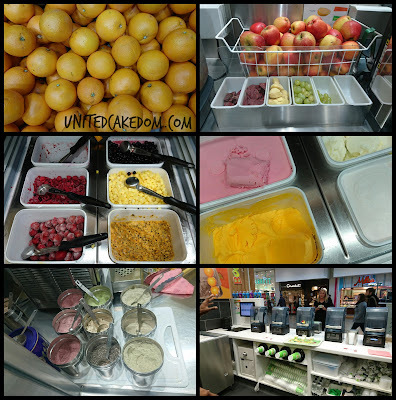 Until last week when I was invited to get a behind the scenes look at how they make their smoothies! 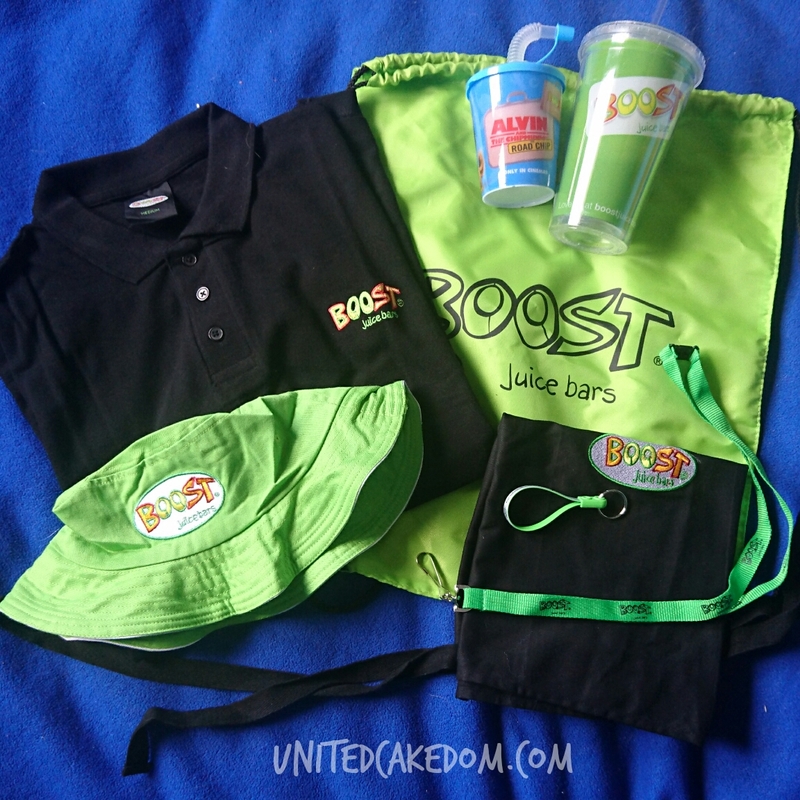 Boost was founded in Australia and was introduced to the UK in 2007 by Richard and Dawn O'Sullivan. 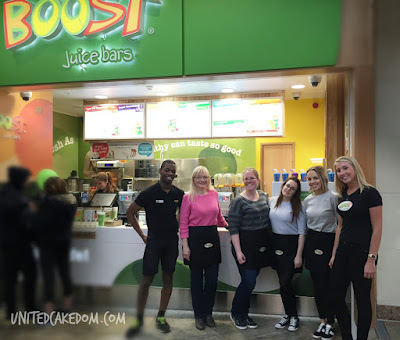 They saw a lack in the UK market for freshly made smoothies and changed that by opening a Boost here in the UK. The first shop is in Manchester and is to this day the 2nd most popular store in the world! Melbourne of course is number 1. Smoothies, although a very simple concept, are super good for you and taste great! There is probably a diet trend or someone out there ready to disagree with that statement. There are a million arguments for and against blending and juicing fruit and vegetables. From what I gather is that no one has a solid answer. Because some fibres are increased and some decreased by blending and some nutrients absorb better when juiced and others not so much. At the end of the day people today don't eat the amount of fruit and vegetables that they should be eating. A smoothie has at least one type of fruit or vegetable and usual contain more. In my opinion that can only be a good thing and when they taste amazing it's hard to argue how they aren't good for you. I chose to make the Strawberry Squeeze, it is made with strawberries, banana, apple juice, no fat milk, TD4 strawberry yogurt and ice. I replaced the apple juice with orange juice. 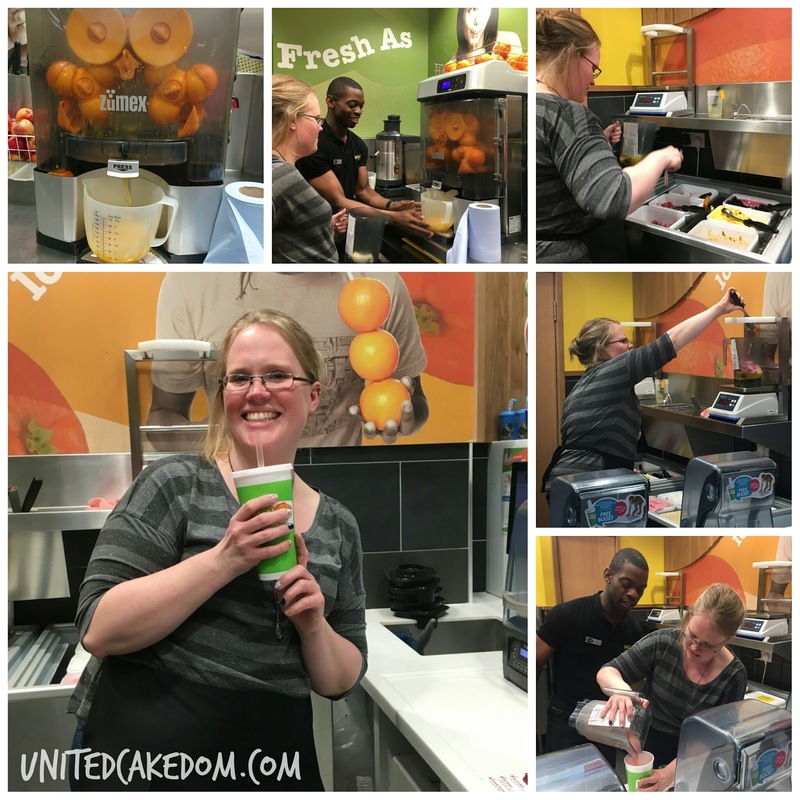 It means I got to use the fun orange juicing machine pictured above! One of the perks of Boost - you can make the smoothie your own! 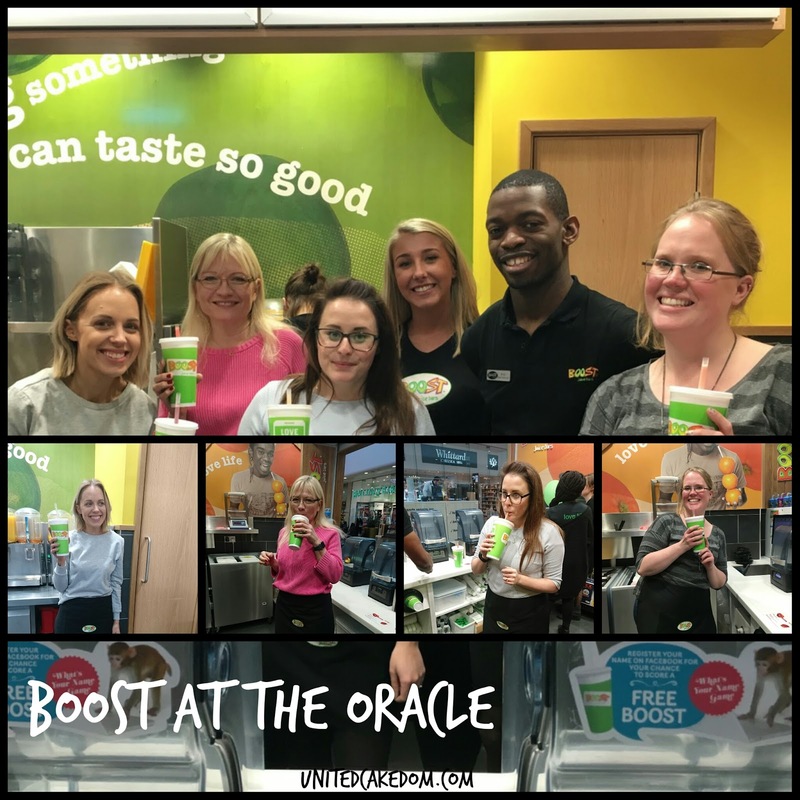 Swap fruits or juices or add a supplement; Boost want you to like and enjoy your smoothie so they are flexible! I believe all of us added or changed things in our smoothies one of us even asked for something off menu! We all had a lot of fun making our smoothies and were all happy with our choices! After my experience I will definitely be stopping by for a smoothie and not just walking by looking at it! I know my girls will love it too! notes: I was invited to visit Boost by the Oracle and Boost as a PR event, I was compensated for my time, but was not asked to give a positive response - all opinions are my own please see my contact/policy page for more information. 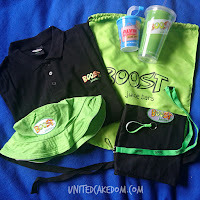 Oh and one last thing we were given a gym bag full of fun Boost stuff! Polo shirt, cups, key chains, hats, and stuff!! Sounds and looks so fun, gutted I couldn't make it! It was actually a lot of fun! Maybe the next event at the Oracle!! Looks like a great event, and that smoothie drink you created sounds great. I can't remember the last time I had a smoothie, we had a boost in my home town but I never had one. I don't know if there is one in Bournemouth, I'm sure there is but I'll have to check it out!! And you're right people don't have enough fruit and veg a day so smoothies are a great way to get your nutrients! Definitely worth a look! There are slowly spreading across the UK!! Looks like an awesome place! I love smoothies! Smoothies are so good! My strawberry one was so good and filling I didn't have dinner that night! Cleaning is never a fun job! However, it seems very lively and a fun place to work!